Definition: This is the root element for the Proteomics Standards Initiative (PSI) mzML schema, which is intended to capture the use of a mass spectrometer, the data generated, and the initial processing of that data (to the level of the peak list). accession xs:string optional An optional accession number for the mzML document. id xs:string optional An optional id for the mzML document. It is recommended to use LSIDs when possible. version xs:string required The version of this mzML document. cvList 1 1 Container for one or more controlled vocabulary definitions. 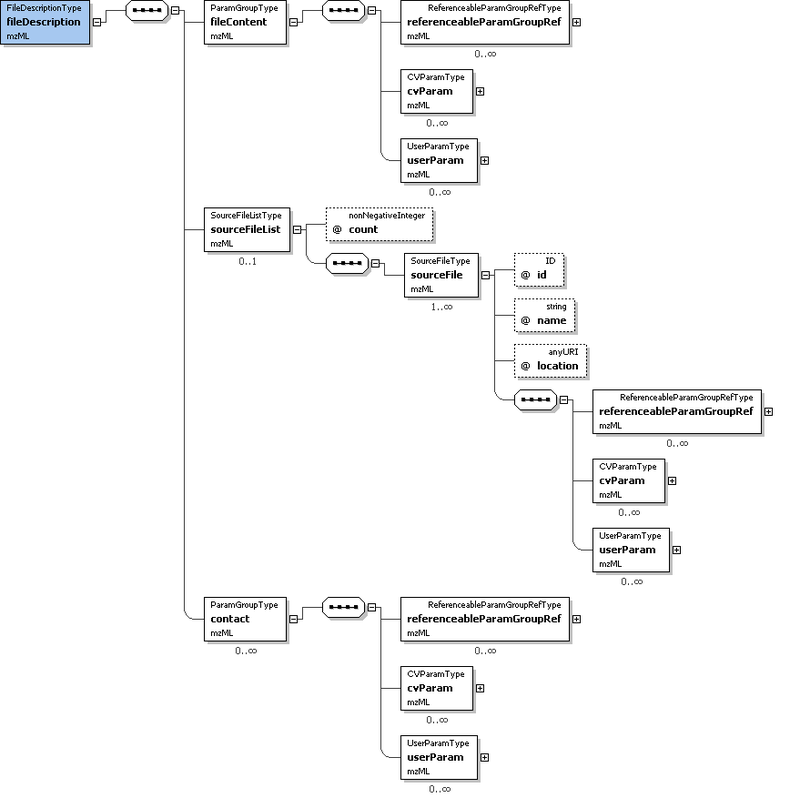 fileDescription 1 1 Information pertaining to the entire mzML file (i.e. not specific to any part of the data set) is stored here. sampleList 0 1 List and descriptions of samples. instrumentConfigurationList 1 1 List and descriptions of instrument configurations. softwareList 1 1 List and descriptions of software used to acquire and/or process the data in this mzML file. dataProcessingList 1 1 List and descriptions of data processing applied to this data. acquisitionSettingsList 0 1 List with the descriptions of the acquisition settings applied prior to the start of data acquisition. run 1 1 A run in mzML should correspond to a single, consecutive and coherent set of scans on an instrument. Notes and Constraints: The <mzML> element and all content below may occur by itself in an XML document, but is also designed to be wrapped in the mzML indexing schema in order to facilitate random access within the file with appropriate reader software. Definition: Container for one or more controlled vocabulary definitions. count xs:nonNegativeInteger required The number of CV definitionsin this mzML file. cv 1 unbounded Information about an ontology or CV source and a short 'lookup' tag to refer to. Notes and Constraints: One of the <cv> elements in this list MUST be the PSI MS controlled vocabulary. All <cvParam> elements in the document MUST refer to one of the <cv> elements in this list. Definition: Information pertaining to the entire mzML file (i.e. not specific to any part of the data set) is stored here. fileContent 1 1 This summarizes the different types of spectra that can be expected in the file. This is expected to aid processing software in skipping files that do not contain appropriate spectrum types for it. 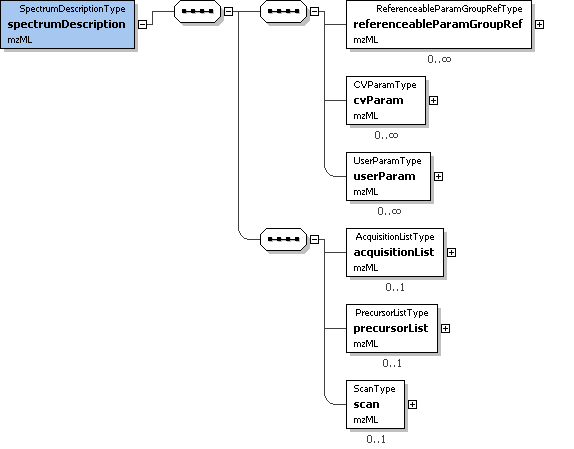 contact 0 unbounded Structure allowing the use of a controlled (cvParam) or uncontrolled vocabulary (userParam), or a reference to a predefined set of these in this mzML file (paramGroupRef). count xs:nonNegativeInteger required The number of ParamGroups defined in this mzML file. 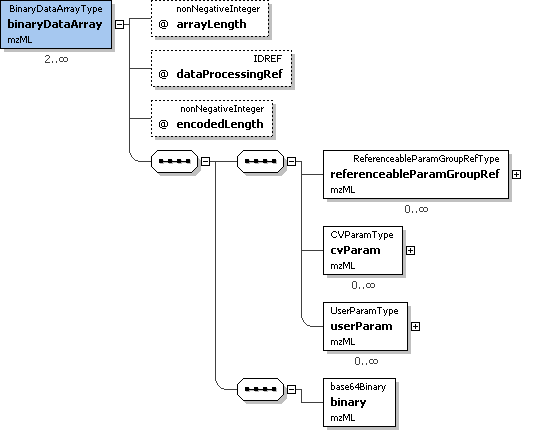 referenceableParamGroup 1 unbounded A collection of CVParam and UserParam elements that can be referenced from elsewhere in this mzML document by using the 'paramGroupRef' element in that location to reference the 'id' attribute value of this element. Definition: List and descriptions of samples. 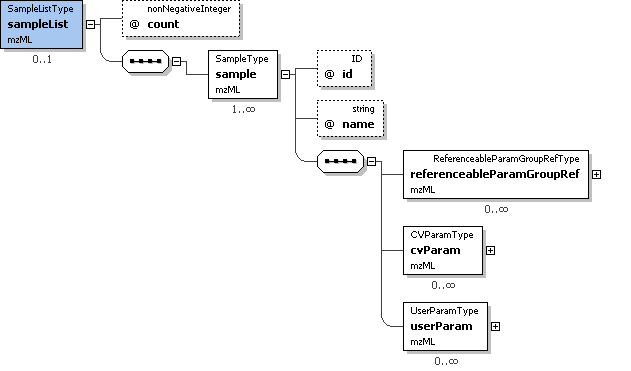 count xs:nonNegativeInteger required The number of Samples defined in this mzML file. sample 1 unbounded Expansible description of the sample used to generate the dataset, named in sampleName. Definition: List and descriptions of instrument configurations. count xs:nonNegativeInteger required The number of instrument configurations present in this list. instrumentConfiguration 1 unbounded Description of a particular hardware configuration of a mass spectrometer. Each configuration MUST have one (and only one) of the three different components used for an analysis. For hybrid instruments, such as an LTQ-FT, there MUST be one configuration for each permutation of the components that is used in the document. For software configuration, use a ReferenceableParamGroup element. 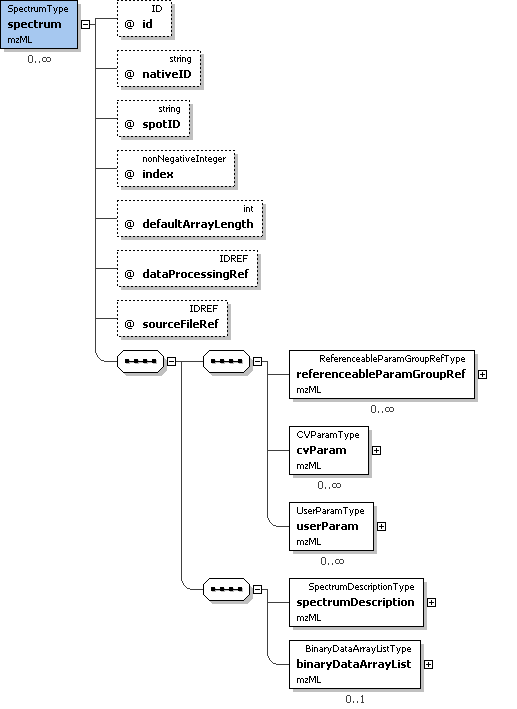 Definition: List and descriptions of software used to acquire and/or process the data in this mzML file. 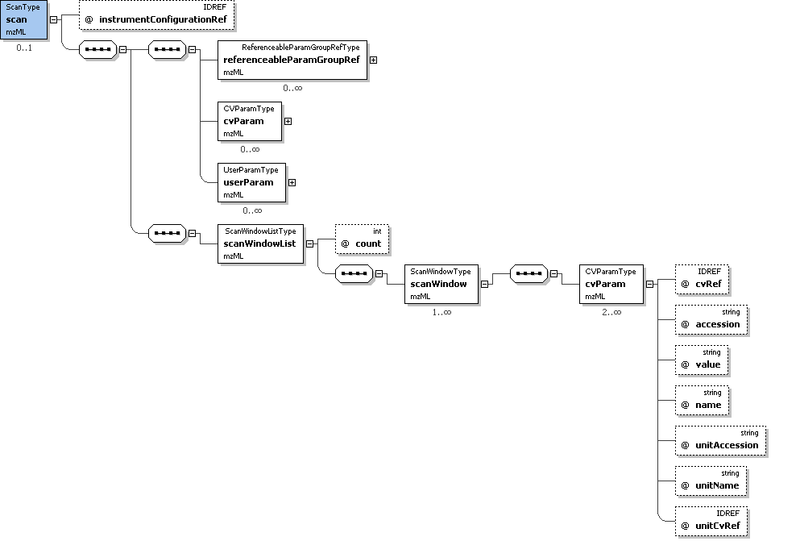 count xs:nonNegativeInteger required The number of softwares defined in this mzML file. software 1 unbounded A piece of software. Definition: List and descriptions of data processing applied to this data. 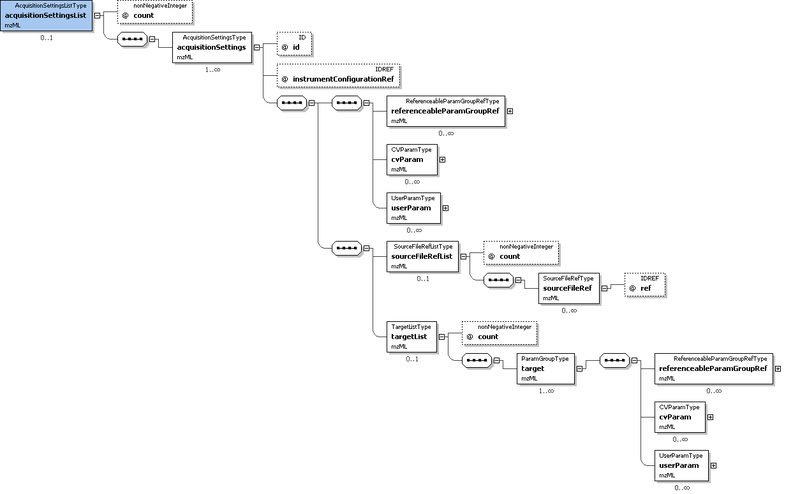 count xs:nonNegativeInteger required The number of DataProcessingTypes in this mzML file. dataProcessing 1 unbounded Description of the way in which a particular software was used. Definition: List with the descriptions of the acquisition settings applied prior to the start of data acquisition. count xs:nonNegativeInteger required The number of AcquisitionType elements in this list. acquisitionSettings 1 unbounded Description of the acquisition settings of the instrument prior to the start of the run. Definition: A run in mzML should correspond to a single, consecutive and coherent set of scans on an instrument. 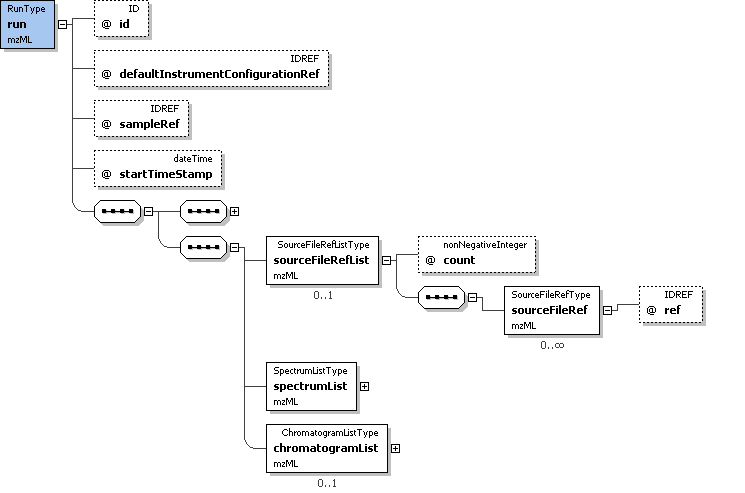 defaultInstrumentConfigurationRef xs:IDREF required This attribute MUST reference the 'id' of the default instrument configuration. If a scan does not reference an instrument configuration, it implicitly refers to this configuration. id xs:ID required A unique identifier for this run. sampleRef xs:IDREF optional This attribute MUST reference the 'id' of the appropriate sample. startTimeStamp xs:dateTime optional The optional start timestamp of the run, in UT. referenceableParamGroupRef 0 unbounded A reference to a previously defined ParamGroup, which is a reusable container of one or more cvParams. cvParam 0 unbounded This element holds additional data or annotation. Only controlled values are allowed here. sourceFileRefList 0 1 Container for a list of source file references. spectrumList 1 1 All mass spectra and the acquisitions underlying them are described and attached here. Subsidiary data arrays are also both described and attached here. chromatogramList 0 1 All chromatograms for thsi run. Definition: Information about an ontology or CV source and a short 'lookup' tag to refer to. URI xs:anyURI required The URI for the resource. fullName xs:string required The usual name for the resource (e.g. The PSI-MS Controlled Vocabulary). id xs:ID required The short label to be used as a reference tag with which to refer to this particular Controlled Vocabulary source description (e.g., from the cvLabel attribute, in CVParamType elements). version xs:string optional The version of the CV from which the referred-to terms are drawn. Definition: This summarizes the different types of spectra that can be expected in the file. This is expected to aid processing software in skipping files that do not contain appropriate spectrum types for it. count xs:nonNegativeInteger required Number of source files used in generating the instance document. sourceFile 1 unbounded Description of the source file, including location and type. 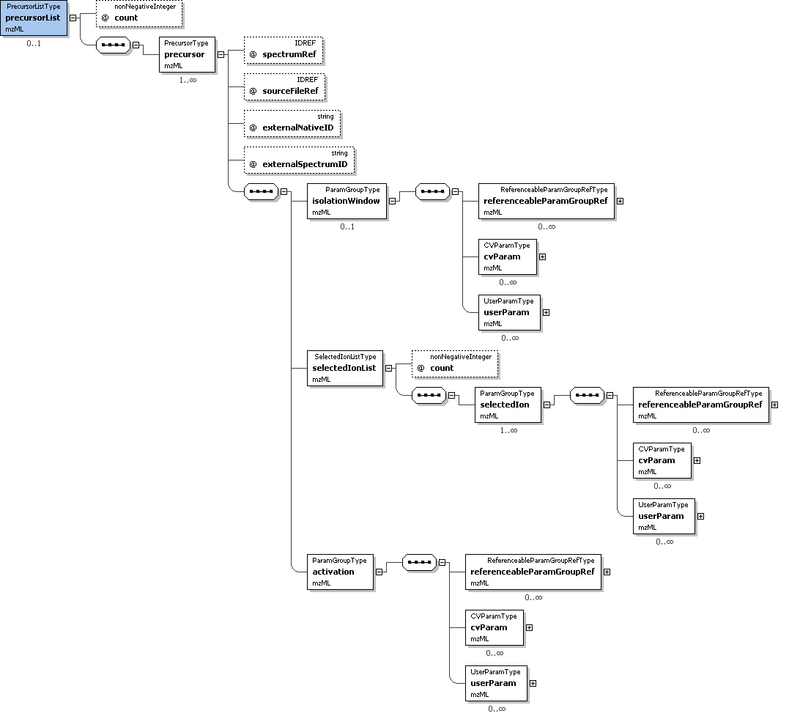 Definition: Structure allowing the use of a controlled (cvParam) or uncontrolled vocabulary (userParam), or a reference to a predefined set of these in this mzML file (paramGroupRef). 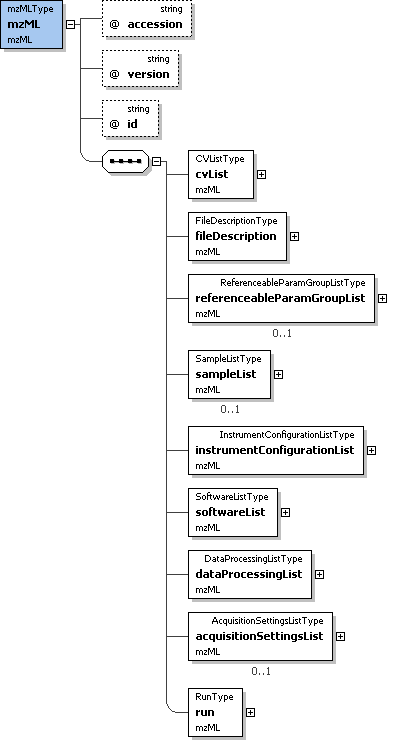 Definition: A collection of CVParam and UserParam elements that can be referenced from elsewhere in this mzML document by using the 'paramGroupRef' element in that location to reference the 'id' attribute value of this element. id xs:ID required The identifier with which to reference this ReferenceableParamGroup. Definition: Expansible description of the sample used to generate the dataset, named in sampleName. id xs:ID required A unique identifier across the samples with which to reference this sample description. name xs:string optional An optional name for the sample description, mostly intended as a quick mnemonic. Definition: Description of a particular hardware configuration of a mass spectrometer. Each configuration MUST have one (and only one) of the three different components used for an analysis. For hybrid instruments, such as an LTQ-FT, there MUST be one configuration for each permutation of the components that is used in the document. For software configuration, use a ReferenceableParamGroup element. id xs:ID required An identifier for this instrument configuration. componentList 1 1 List with the different components used in the mass spectrometer. At least one source, one mass analyzer and one detector need to be specified. Definition: A piece of software. id xs:ID required An identifier for this software that is unique across all SoftwareTypes. softwareParam 1 1 A description of the software, based on CV information and a software version. Definition: Description of the way in which a particular software was used. id xs:ID required A unique identifier for this data processing that is unique across all DataProcessingTypes. softwareRef xs:IDREF required This attribute MUST reference the 'id' of the appropriate SoftwareType. processingMethod 1 unbounded Description of the default peak processing method. This element describes the base method used in the generation of a particular mzML file. Variable methods should be described in the appropriate acquisition section - if no acquisition-specific details are found, then this information serves as the default. Definition: Description of the acquisition settings of the instrument prior to the start of the run. id xs:ID required A unique identifier for this acquisition setting. instrumentConfigurationRef xs:IDREF required This attribute MUST reference the 'id' of the appropriate instrument configuration. targetList 0 1 Target list (or 'inclusion list') configured prior to the run. Definition: A reference to a previously defined ParamGroup, which is a reusable container of one or more cvParams. ref xs:IDREF required Reference to the id attribute in a referenceableParamGroup. Definition: This element holds additional data or annotation. Only controlled values are allowed here. accession xs:string required The accession number of the referred-to term in the named resource (e.g. : MS:000012). cvRef xs:IDREF required A reference to the CV 'id' attribute as defined in the cvList in this mzML file. name xs:string required The actual name for the parameter, from the referred-to controlled vocabulary. This should be the preferred name associated with the specified accession number. unitAccession xs:string optional An optional CV accession number for the unit term associated with the value, if any (e.g., 'UO:0000266' for 'electron volt'). unitCvRef xs:IDREF optional If a unit term is referenced, this attribute MUST refer to the CV 'id' attribute defined in the cvList in this mzML file. unitName xs:string optional An optional CV name for the unit accession number, if any (e.g., 'electron volt' for 'UO:0000266' ). value xs:string optional The value for the parameter; may be absent if not appropriate, or a numeric or symbolic value, or may itself be CV (legal values for a parameter should be enumerated and defined in the ontology). name xs:string required The name for the parameter. type xs:string optional The datatype of the parameter, where appropriate (e.g. : xsd:float). value xs:string optional The value for the parameter, where appropriate. Definition: Container for a list of source file references. count xs:nonNegativeInteger required This number of source files referenced in this list. sourceFileRef 0 unbounded Reference to a previously defined sourceFile. Definition: All mass spectra and the acquisitions underlying them are described and attached here. Subsidiary data arrays are also both described and attached here. count xs:nonNegativeInteger required The number of spectra defined in this mzML file. Definition: All chromatograms for thsi run. 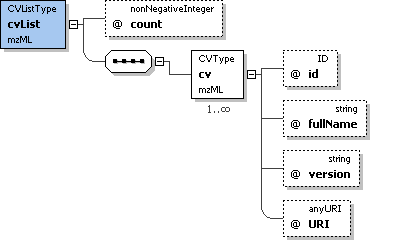 count xs:nonNegativeInteger required The number of chromatograms defined in this mzML file. chromatogram 1 unbounded A single chromatogram. Definition: Description of the source file, including location and type. id xs:ID required An identifier for this file. location xs:anyURI required URI-formatted location where the file was retrieved. name xs:string required Name of the source file, without reference to location (either URI or local path). Definition: List with the different components used in the mass spectrometer. At least one source, one mass analyzer and one detector need to be specified. count xs:nonNegativeInteger required The number of components in this list. source 1 1 A source component. analyzer 1 1 A mass analyzer (or mass filter) component. detector 1 1 A detector component. ref xs:IDREF required This attribute MUST be used to reference the 'id' attribute of a software element. Definition: A description of the software, based on CV information and a software version. accession xs:string required The accession number for this CV term. name xs:string required The preferred name in the CV for the accession number of this CV term. version xs:string required The software version. Definition: Description of the default peak processing method. This element describes the base method used in the generation of a particular mzML file. Variable methods should be described in the appropriate acquisition section - if no acquisition-specific details are found, then this information serves as the default. order xs:nonNegativeInteger required This attributes allows a series of consecutive steps to be placed in the correct order. Definition: Target list (or 'inclusion list') configured prior to the run. count xs:nonNegativeInteger required The number of TargetType elements in this list. 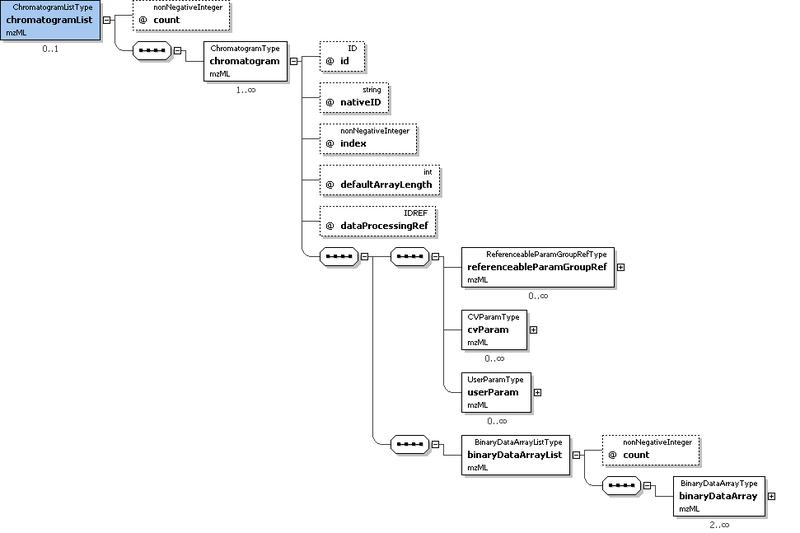 target 1 unbounded Structure allowing the use of a controlled (cvParam) or uncontrolled vocabulary (userParam), or a reference to a predefined set of these in this mzML file (paramGroupRef). Definition: Reference to a previously defined sourceFile. ref xs:IDREF required This attribute MUST reference the 'id' of the appropriate sourceFile. dataProcessingRef xs:IDREF optional This attribute can optionally reference the 'id' of the appropriate dataProcessing. defaultArrayLength xs:int required Default length of binary data arrays contained in this element. id xs:ID required A unique identifier for this spectrum. It should be expected that external files may use this identifier together with the mzML filename or accession to reference a particular spectrum. index xs:nonNegativeInteger required The zero-based, consecutive index of the spectrum in the SpectrumList. nativeID xs:string required The native identifier for the spectrum, used by the acquisition software. sourceFileRef xs:IDREF optional This attribute can optionally reference the 'id' of the appropriate sourceFile. spotID xs:string optional The identifier for the spot from which this spectrum was derived, if a MALDI or similar run. spectrumDescription 1 1 Description of the parameters for the mass spectrometer for a given acquisition (or list of acquisitions). binaryDataArrayList 0 1 List of binary data arrays. Notes and Constraints: id's MUST be unique within a file. They may be LSIDs or simply the scan number. scanNumbers MUST be unique within a file and MUST be monotonically increasing throughout the file, although not necessarily sequentially. If a scan yields no peaks, it should still be reported, but with a defaultArrayLength of 0 and no <binaryDataArrayList> element. id xs:ID required A unique identifier for this chromatogram. index xs:nonNegativeInteger required The zero-based index for this chromatogram in the chromatogram list. binaryDataArrayList 1 1 List of binary data arrays. order xs:int required This attribute MUST be used to indicate the order in which the components are encountered from source to detector (e.g., in a Q-TOF, the quadrupole would have the lower order number, and the TOF the higher number of the two). Definition: A mass analyzer (or mass filter) component. Definition: Description of the parameters for the mass spectrometer for a given acquisition (or list of acquisitions). acquisitionList 0 1 List and descriptions of acquisitions . precursorList 0 1 List and descriptions of precursors to the spectrum currently being described. scan 0 1 The instrument's 'run time' parameters; common to the whole of this spectrum. Definition: List of binary data arrays. count xs:nonNegativeInteger required The number of binary data arrays defined in this list. Definition: List and descriptions of acquisitions . count xs:nonNegativeInteger required the number of acquisitions defined in this mzML file. acquisition 1 unbounded Scan or acquisition from original raw file used to create this peak list, as specified in sourceFile. Definition: List and descriptions of precursors to the spectrum currently being described. count xs:nonNegativeInteger required The number of precursors in this list. Definition: The instrument's 'run time' parameters; common to the whole of this spectrum. instrumentConfigurationRef xs:IDREF optional This attribute MUST reference the 'id' attribute of the appropriate instrument configuration. scanWindowList 1 1 Container for a list of select windows. arrayLength xs:nonNegativeInteger optional This optional attribute may override the 'defaultArrayLength' defined in SpectrumType. The two default arrays (m/z and intensity) should NEVER use this override option, and should therefore adhere to the 'defaultArrayLength' defined in SpectrumType. Parsing software can thus safely choose to ignore arrays of lengths different from the one defined in the 'defaultArrayLength' SpectrumType element. dataProcessingRef xs:IDREF optional This optional attribute may reference the 'id' attribute of the appropriate dataProcessing. encodedLength xs:nonNegativeInteger required The encoded length of the binary data array. binary 1 1 The actual base64 encoded binary data. Notes and Constraints: The arrayLength attribute need only be specified if it is different from the defaultArrayLength specified in the <spectrum> element. Definition: Scan or acquisition from original raw file used to create this peak list, as specified in sourceFile. externalNativeID xs:string optional For acquisitions that are external to this document which can be referenced by nativeID, this string MUST correspond to the 'nativeID' attribute of a spectrum in the external document indicated by 'sourceFileRef'. externalSpectrumID xs:string optional For acquisitions that are external to this document which cannot be referenced by nativeID, this string MUST correspond to the 'id' attribute of a spectrum in the external document indicated by 'sourceFileRef'. number xs:int required A number for this acquisition. sourceFileRef xs:IDREF optional For acquisitions that are external to this document, this attribute MUST reference the 'id' attribute of a sourceFile representing that external document. spectrumRef xs:IDREF optional For acquisitions that are local to this document, this attribute MUST reference the 'id' attribute of the appropriate spectrum. externalNativeID xs:string optional For precursor spectra that are external to this document which can be referenced by nativeID, this string MUST correspond to the 'nativeID' attribute of a spectrum in the external document indicated by 'sourceFileRef'. 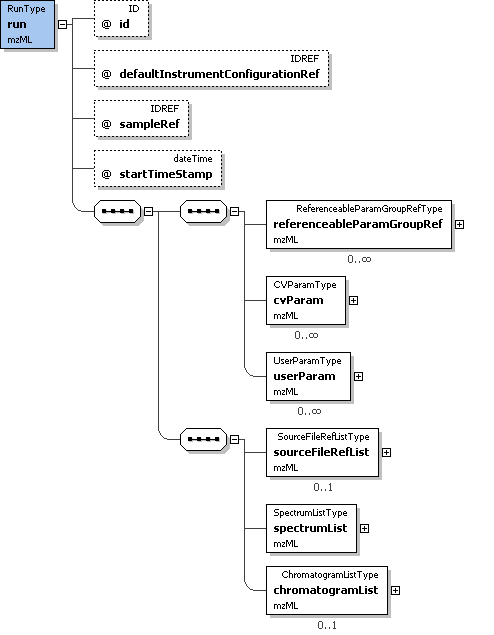 externalSpectrumID xs:string optional For precursor spectra that are external to this document which cannot be referenced by nativeID, this string MUST correspond to the 'id' attribute of a spectrum in the external document indicated by 'sourceFileRef'. sourceFileRef xs:IDREF optional For precursor spectra that are external to this document, this attribute MUST reference the 'id' attribute of a sourceFile representing that external document. 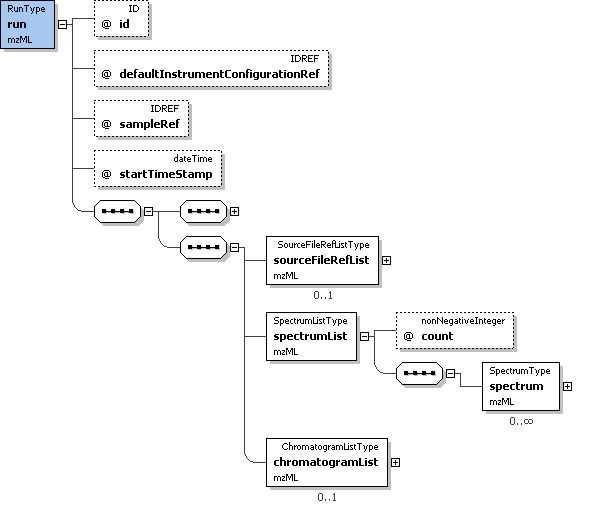 spectrumRef xs:IDREF optional Reference to the id attribute of the spectrum from which the precursor was selected. isolationWindow 0 1 This element captures the isolation (or 'selection') window configured to isolate one or more precursors. selectedIonList 1 1 This list of precursor ions that were selected. activation 1 1 The type and energy level used for activation. Definition: Container for a list of select windows. count xs:int required The number of selection windows defined in this list. scanWindow 1 unbounded Definition of a selection window. Definition: The actual base64 encoded binary data. Definition: This element captures the isolation (or 'selection') window configured to isolate one or more precursors. Definition: This list of precursor ions that were selected. count xs:nonNegativeInteger required The number of selected precursor ions defined in this list. 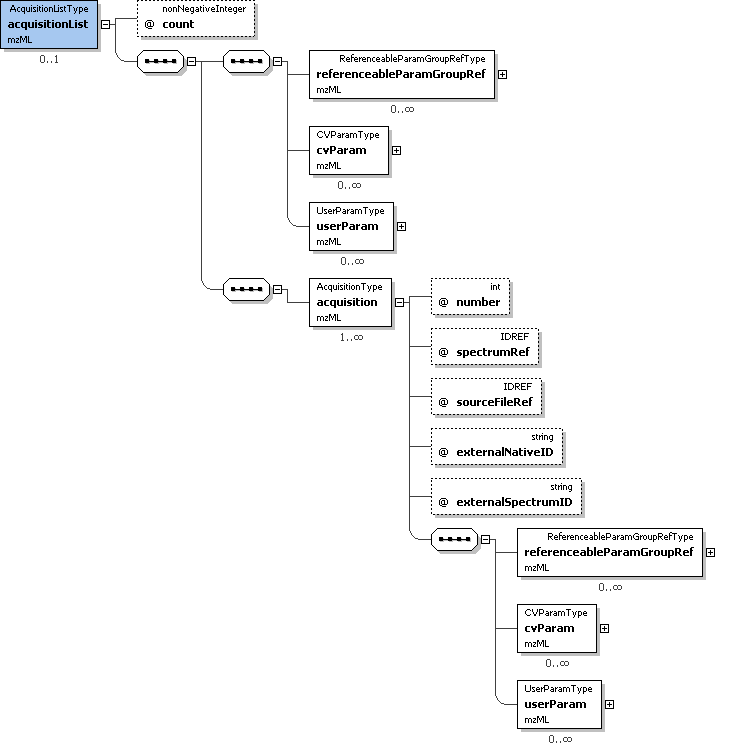 selectedIon 1 unbounded Structure allowing the use of a controlled (cvParam) or uncontrolled vocabulary (userParam), or a reference to a predefined set of these in this mzML file (paramGroupRef). Definition: The type and energy level used for activation. Definition: Definition of a selection window. cvParam 2 unbounded This element holds additional data or annotation. Only controlled values are allowed here.